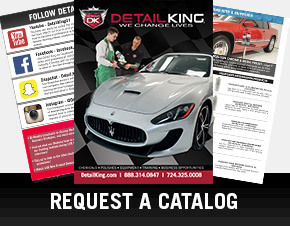 Having the proper auto detailing towels and special microfiber towels for cars always on hand and keeping them clean and maintained goes a real long way toward a successful auto detail. That means you should make sure to have a variety of clean towels for various detailing tasks — and it doesn’t hurt a bit to have them color-coded so you don’t cross-contaminate them when washing. 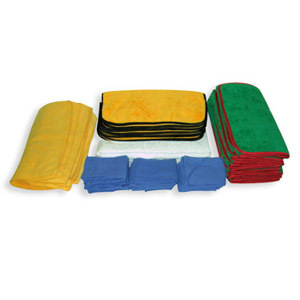 We suggest you have at least five different groups of towels for all of your detailing tasks. Here’s a breakdown of how you may want to organize your towels. 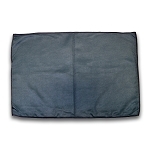 1) Grease & Tar Towels – Use these shop towels for cleaning and removing grease from engine compartments and door jambs. 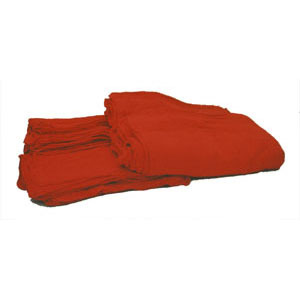 Typically you want to use an inexpensive towel, and a red shop towel is just the ticket! Don’t wash and dry these towels with your other towels because they will contain grease, plus the red dye could bleed onto your other textiles. 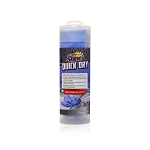 You can also use some inexpensive white cotton towels to remove tar overspray from the paint prior to buffing it out. Don’t rub too hard because these towels will scratch the surface. Don’t wash these towels with any other towels either. Some detailers keep a pile of separate microfiber towels to remove tar because they won’t scratch the car surface. But again, you’ll only want to use this batch for tar removal. 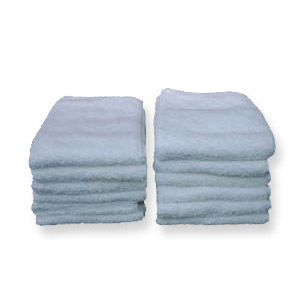 2) Polishing Towels – Microfiber towels make excellent polishing towels. 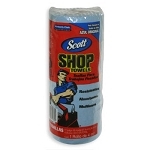 Use these towels to remove polish, wax and sealants or use as a final wipe down. 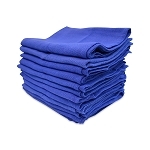 Microfiber towels last longer than normal cotton, are typically lint free, non abrasive and do a great job for polishing cars. Never dry microfiber towels with other towels – they absorb so well they will get full of lint form other towels in the dryer. The perfect size would be a 16 x 16 or a 15 x 25. We carry blue, green, and yellow. 3) Window Towels – Only use your window towels for cleaning glass, plastic and mirrors. Our huck lint free window towels or the new ultra microfiber glass cleaning towel that also does a great job cleaning windows without leaving smears and lint. Always clean the exterior windows first and have at least 2 fresh towels for interior windows, flipping and folding them over so you are always applying a clean towel surface to the glass. Many detailers will use one towel to apply the glass cleaner and use two towels to dry with. 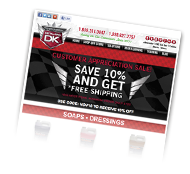 The less glass cleaner product you use the better! Think of window cleaning as a polishing of the glass instead of cleaning it. Never, ever wash or dry these towels with your other detailing towels. 4) Interior Fabric Components – For headliners, carpets, and velour and fabric upholstery use a white cotton Turkish towel. 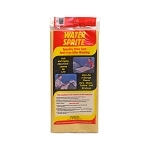 These towels are excellent to gently scrub with and also to remove dirty soapy water from carpets and upholstery. Do not use dyed Turkish towels, they do not absorb well and could transfer the dye onto certain fabrics. Don’t be concerned if your white towels have stains in them after washing. They will be clean, they just will not be pretty! Turkish towels make good utility towels. Never use them as a final wipe down towel, they will put light scratches in the paint. 5) Interior Vinyl/Leather Components – Microfiber towels also do a great job assisting with cleaning and detailing vinyl and leather interior components. The perfect size would be a 16 x 16. We carry a pink microfiber car interior cleaning towel that has a different fiber mesh from our polishing and glass microfibers. These microfibers are perfect for cleaning dash boards, door panels, consoles, leather seating surfaces, hard and soft vinyl trim. All new towels should be washed before you put them into service. It is a good idea to pour a cup of white vinegar instead of soap into your wash load of towels before you start to use them. By washing them with vinegar will season the towel, fluff it up and make it absorb better. Be sure to dry them in the dryer before using them. It is not a bad idea to use vinegar once or twice a month after you have washed your towels, before you dry them run them through another wash cycle with a cup of white vinegar. 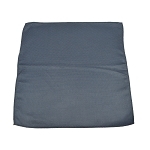 This will help keep the towels lint free and very absorbent. Never use detergent with bleach, bleach alternatives or fabric softener. Bleach will cause the towels to lint and break-down the fiber structure. Fabric softener will make them less absorbent and cause smears. 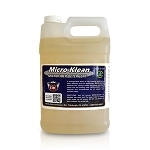 We have a great detergent soap for all detailing towels including microfibers, it is called Micro Klean. Many detailers are now using jumbo-sized microfibers to dry cars with. 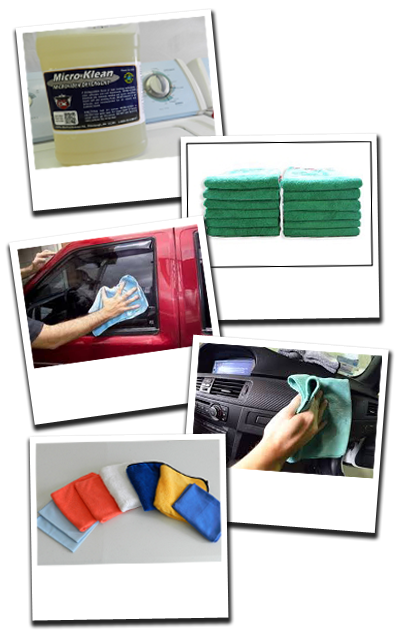 Many say microfibers do a better job drying the wet surfaces of the vehicle exterior. When drying microfiber towels use very low heat so not to damage the fibers, this will keep their super absorbing powers at an optimum level. Use individual bins to keep the towel groups separated. This will reduce sorting time when preparing to lauder them and also will keep them from cross contamination.